Preheat the oven to 350 degrees F. Lightly spray the bottom and sides of a 9-by-13-inch metal baking pan with cooking spray. Line the pan with parchment, leaving at least a 2-inch overhang on all sides. Prepare and bake the brownies in the prepared pan according to the package directions for a 9-by-13-inch baking pan. Let cool completely on a rack, about 1 hour. 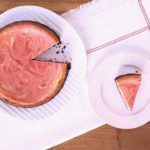 Meanwhile, slice 5 to 6 strawberries into ⅛-inch-thick slices--you will need enough to fit around the edges of the pan; set aside. Leave the remaining strawberries whole. Beat the cream cheese, sugar and 3½ cups of the heavy cream in a large bowl with an electric mixer on medium speed until stiff peaks form, 3 to 4 minutes. Fold in the sour cream and vanilla until smooth. Bring the remaining ½ cup heavy cream to a boil in a small saucepan, then whisk in the gelatin. Continue to whisk off heat until the gelatin is dissolved, 2 to 3 minutes. Fold the gelatin mixture into the cream cheese mixture until well combined. Stand the sliced strawberries upside down around the perimeter of the pan with the flat/cut sides touching the side of the pan, cutting an extra strawberry or two if needed. Pour 3 cups of the cream cheese mixture on top of the brownies and use an offset spatula to spread and smooth it out. Press the remaining whole strawberries into the cream cheese upside down (pointed ends up); you should have about 8 rows of 5. Spread the remaining cream mixture on top of the strawberries and smooth out the top with an offset spatula. Chill until set, at least 2 hours and up to overnight. 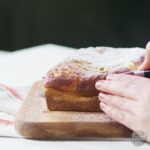 When ready to serve, use the parchment overhang to remove the dessert from the pan and place onto a serving platter (trim the parchment from around the edges). 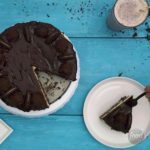 Drizzle the top with chocolate fudge sauce and cut into bars. 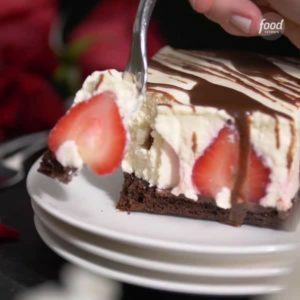 Recipe of the Day: Buried Strawberry Cheesecake🍓Save the recipe: https://foodtv.com/2ScQ9uG!